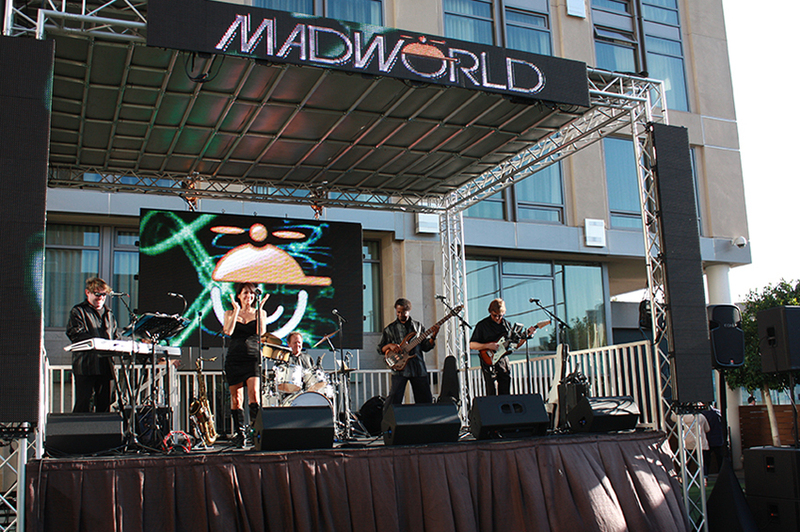 A review of MadWorld 2014 | Hard Rock Hotel | San Diego, CA | April 13–15. Pam Coca shares her experience. MadWorld is an annual technical communication event that rocks in more ways than one. Sponsored this year by GALA and the transportation app Uber, it included 40 learning sessions presented over two-plus days. Attendees took home best practices in technical communication, learned the latest technologies and trends, networked with peers, and were introduced to MadCap’s newest product developments. This whirlwind event, filled with San Diego sunshine and rock music at the Hard Rock Hotel, was a conference unlike any you’ve ever seen! Attendees and presenters came from around the block and around the world, but the first day began with one of MadCap’s own: Jennifer White. She welcomed us with a hilarious introduction to staff we’d be meeting throughout the conference. Jennifer took the mickey out of everyone portrayed on the big screen, including MadCap CEO Anthony Olivier. She and Paul Stoecklein (also of MadCap fame) created a very Photoshopped rendition of their peers. Twenty different presenters involved in 40 unique talks, categorised into four separate tracks (beginner, intermediate and advanced Flare users, as well as a tools agnostic) is certainly more than we have space to mention, but suffice to say they were all fabulous. 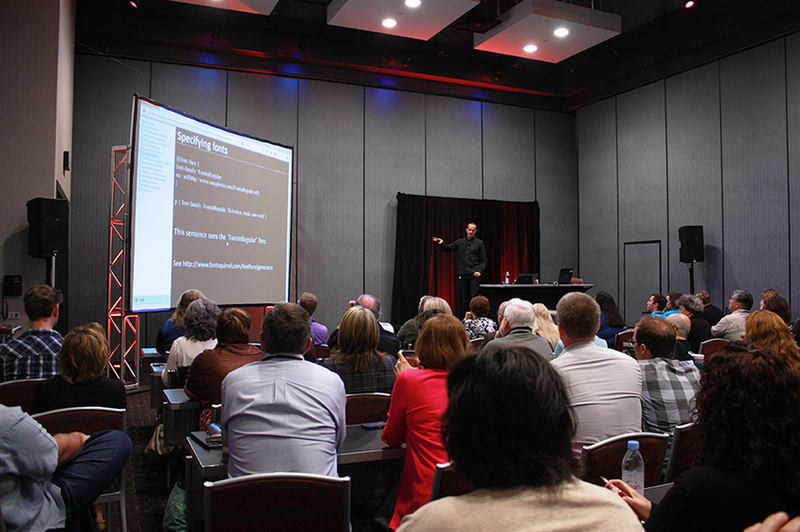 The ever-popular Ellis Pratt of Cherryleaf presented on metrics, DITA and content strategy. His British charm is undeniable and everyone loved that he brought British candies to share. Patrick Calnan’s “Conditional Conundrum” (exploring conditions in Flare) was done in a game show format with prizes. Lynn Carrier really showcased Flare’s versatility with her demo on how Illumina set-up their authoring environment to cater to their customers. Neil Perlin spoke on working with the code side of Flare and demystified content sensitive help. According to Neil, “Responsive design is the most important thing to hit technical communication since HTML in 1997.” For Neil’s article, see page 52–55. One team presentation was the Ride the Lightning (Talk). Guided and ever-so-critically timed by Madcap’s Product Evangelist, Jennifer White, six of us had five minutes each to share information about MadCap software: I led a game of MadCap Jeopardy, tossing prizes to eager winners. Kai Weber of Frankfurt, Germany presented a tale about dentists who recommend Flare for more smiles than any other HAT. Mike Hamilton gave us elusive tips for success in the field of technical communication. Jose Sermeno talked about opensource applications. Scott DeLoach showed several ways to avoid inline formatting with the help of Chuck Norris (who was conspicuous by his absence). Neil Perlin helped us handle Flare project importing and Patrick Calnan explained why we should host our own help systems. At the end, Jennifer had everyone check beneath their chairs for a guitar pick to see who was going home with a bag full of MadCap/Hard Rock goodies. Nothing says MadCap better than their amazing technical support. In Madcap’s inimitable style, they had a Hospitality Lounge setup with everavailable MadCap staff and support teams. It didn’t matter if you needed five minutes or the whole day, they were there to help. Knowing that there is nothing quite like hands-on assistance from the experts, attendees from all over the world brought in their projects and questions. The party started on Sunday evening with drinks and hors d’oeuvres for an intimate gathering of 200+ and talented musician/vocalist Joe Valeri, whose energy and enthusiasm give new meaning to the phrase one-manband. Voted San Diego’s best rooftop bar, Float is set atop the Hard Rock Hotel overlooking the Gaslamp Quarter and it was the perfect way to end a busy day of learning on Monday, as MadWorld attendees settled into comfy seats surrounding glowing fire-pits to discuss the day’s events. By Tuesday evening, with that deer-in-theheadlights look in our eyes, we listened and danced to The Heroes, a seven-piece band that plays everything from big band swing to Motown to classic rock to today’s hits. Fortunately, for those who could not clone themselves to attend numerous talks all at the same time nor take prolific notes during the talks they did attend, MadCap provided thumb drives with presentations-to-go. We can re-live what we did, who we met and what we learned as we recuperate from the days and nights of a mad, mad world of learning and looniness. Pam Coca is an award winning technical writer and content specialist.